Luckily, prior to the onslaught of snow and sleet last Sunday, I had a premonition to move my tool bucket to shelter. (Yes, there was a deliberate mention of those cold "s" words. We think of snow at Thanksgiving. But this year-of-the-prolonged-summer is melding quickly into one of prolonged winter, methinks.) Usually the bucket sits on the front porch, handy for any impromptu gardening. But the prior day I planted "the last" seedlings of the season - some Primula auricula for the west side of the sax bed. The wind was brutal as it often is in fall. After that operation I was chilled to the bone, and so, prepared to put the bucket away for the season. I always keep a bit of crushed granite in the bottom, available at any alpine planting, mulching or weeding situation. This I dump for winter storage of the pail. Why not a plastic pail, one might ask. When I am working, all the tools are usually out and in use. It is a quick trip to the pile for a scoop of crushed granite for more mulch with a metal pail. And the metal rim precludes even the need of a shovel. Plastic just does not hold up. My most favored tools are a set of brick jointers made by Marshalltown here in the US. As Rod watched me struggle with traditional gardening tools while planting tight crevices, he got an idea. 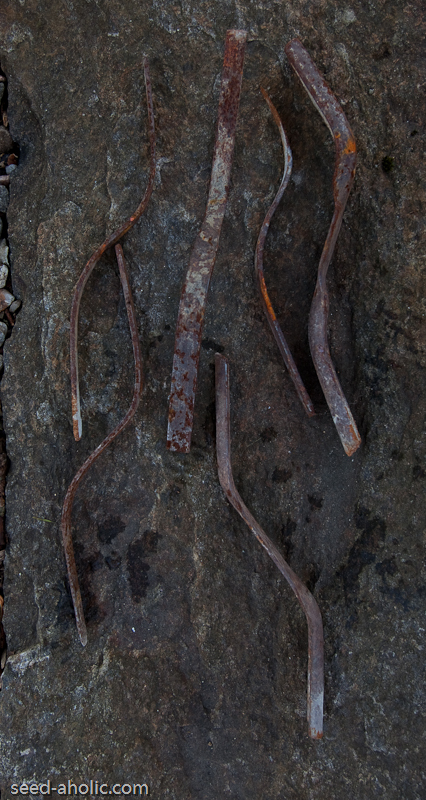 He offered me these masonry hand tools. I have not given them back! Not only can you pack tight places, but also dig and scoop just about everywhere. Yes, most crevices are a roomy couple of inches wide. But more often, some piece of the facing stone comes a little closer to its mate, even kissing at times. These tools make all the difference for getting deep into the crevice. They come in varying sizes, from 3/8" or 3/4" on one end to 1/2" or 7/8" on the other. They are approximately 10 1/2 " long. The S-curve fits them nicely to the hand. To find them, just look at your local hardware store. Even the big chain stores carry them for sale. Talk to a local mason. The next star in the arsenal of productivity enhancers is one I acquired many years ago. White Flower Farm used to sell this as a swoe. Now, they sell a stand-up, long handled version so-called. I have it too, for the vegetable garden summer weeding detail. It is good for keeping after german-weed (local name for Galinsoga ciliata) before it gets over a few inches high. 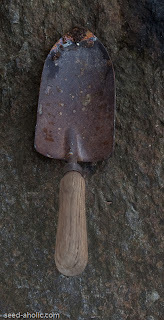 But it is not nearly as handy a tool as its short handled cousin, which does duty in all the gardens, from the vegetables patch to the perennial beds to the rock garden. There is nothing like it for getting the odd dandelion seedling or tubby yellow-dock root (Rumex crispus). 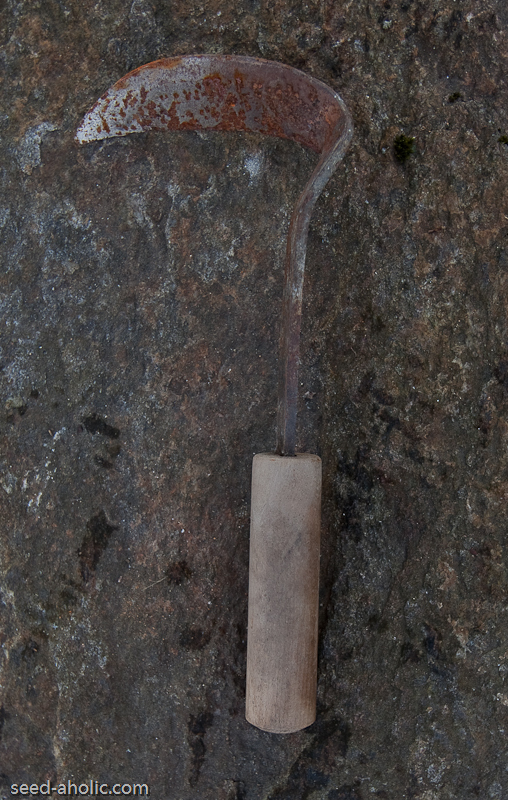 Before Rod graced me with the set of brick jointer tools, this tool did most of the duty in the crevice garden. 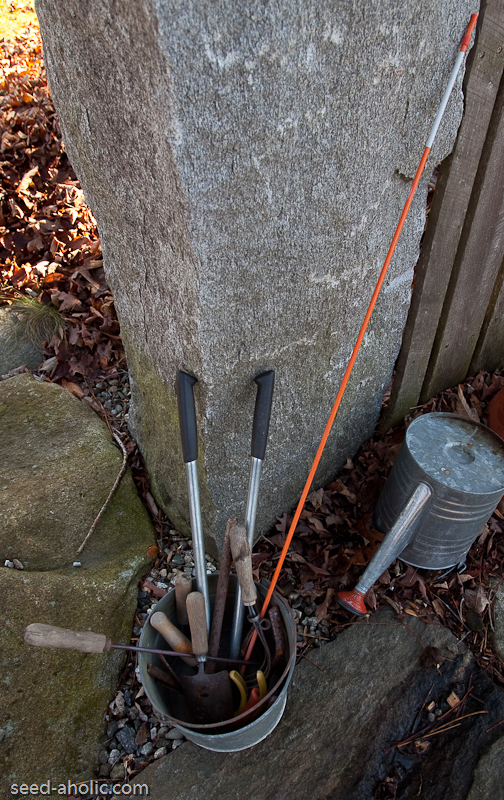 For the new crevice garden plantings two tools were standouts. 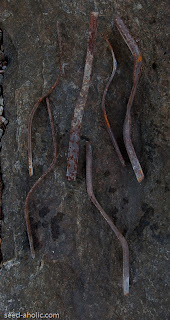 A length of rebar was an easy way to pack in the crushed granite from the ground up. There was just enough weight to make the repetitive tamping process speed along. Round and smooth to hold, its flat end worked the crevice joints with ease. 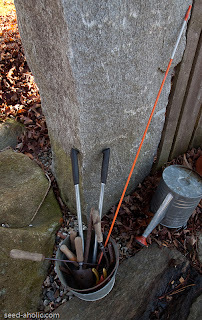 Other uses in the various gardens include a fast-set post for roping off areas for grass seeding, a roller for larger stones, a string hanger to lay out linear rows, noisemaker on a rock to move out the snakes from said rockwork, oh, yes, and reinforcing concrete. The second tool is a fiberglass snow stake for the driveway. What's that? You think I am kidding? The brick jointers are good, but not when the stone crevice is over a foot deep. This is the tool for those tight places way down under. It's perfect for those tight spots 3 feet in, where a stick would break, and the rebar is to large. The hand trowel, of course, is essential to any garden tool bucket. My taste always runs to those with wooden handles and a forged steel blade. It is just that much easier on the hand. (I do keep a few plastic handled ones in the plunge bed year round. That way I never need to go look for one - especially handy if it is early or late in the season. But sand is not difficult to excavate.) The wooden handled ones are comfortable for prolonged work anytime. My hand does not sweat during the heat of summer as it does while using the plastic handled ones for any length of time. I like a bit of a sharp point on the blade too. Sometimes the soil here is compacted, from the clay or sod or such. A sharp point dispatches all resistance and saves the wrist from impact. Also the wide forged blade is of perfect size for making short work of a job. It gets it done now! Naturally they are worth having the handles replaced when the wood deteriorates. But there are inevitably losses due to oversight. I have not seem any lately for sale like this, so always check tag sales in the area. I keep two sets of hand clippers in the pot. Depending on my mood and hand agility, I reach for one or the other. 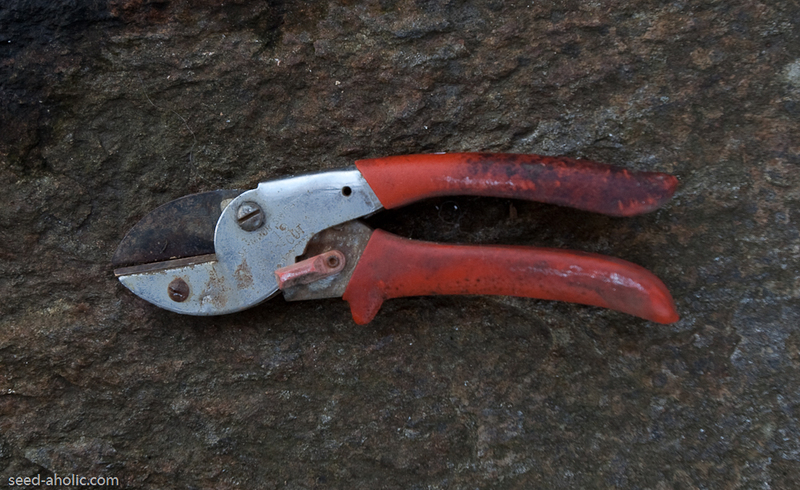 The anvil pruner is a little heavier in the hand, but is great for routine work. (Mine is a vintage product, again available at most local tag sales. I should note, Goshen is up the valley from the old Seymour Smith manufacturing plant, now defunct, which probably accounts for the plethora of goodies at all the garage sales.) 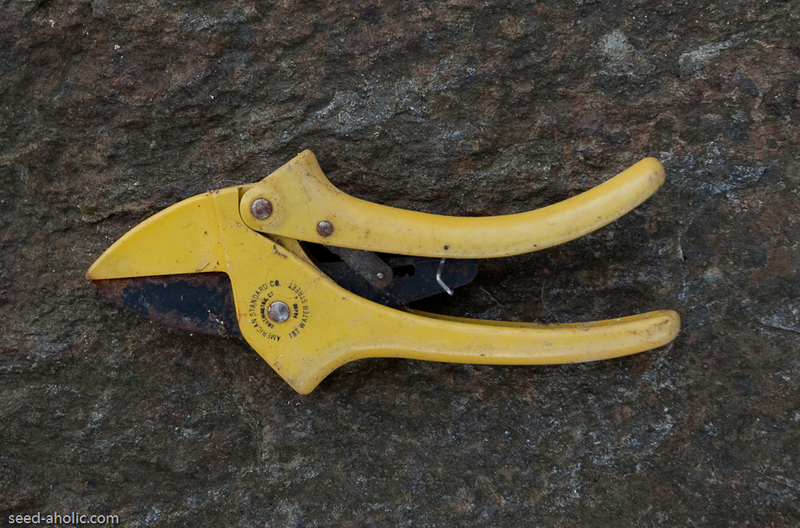 As my hand tires from a long stint of pruning, I will reach for the Florian rachet-cut pruner, which multiplies my hand strength "by 700%". Why don't I always user the Florians? Well, ratcheting is a double work operation. And when the Florians are not enough, there is always the lopper. Once in a while I need a weeding tool like a swoe but with a sharp point. Mind you, this is just the odd time out. But definitely worth its weight to tote in the pail is a Japanese weeding sickle. It's the tip that counts. 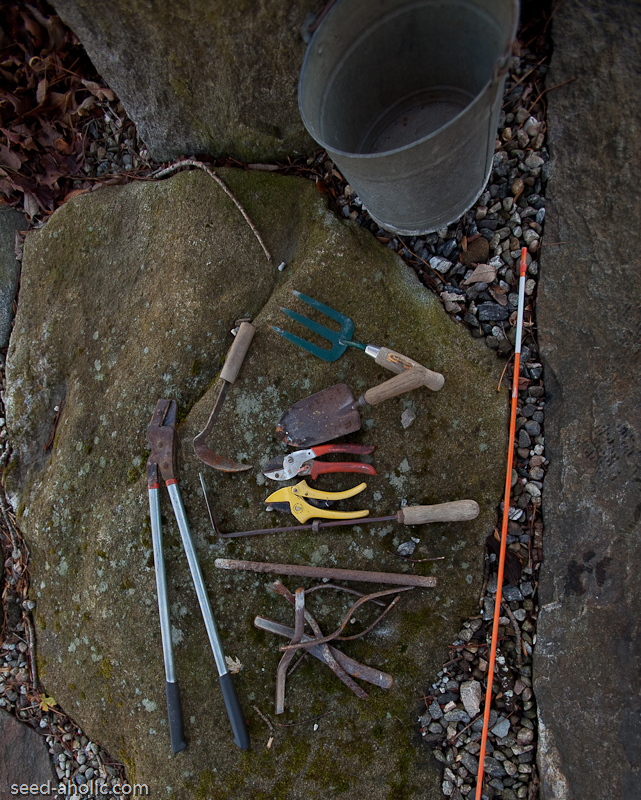 And rounding out the essential pail is the garden hand fork. Lifting that misplaced sax or Primula auricula is easy enough with this. Mine was acquired when Smith & Hawken sold out. But they are available. So now you have it - what I carry from site to site. These tools are handy helpers. There is a shed full of others, but these are the "out-front" best. 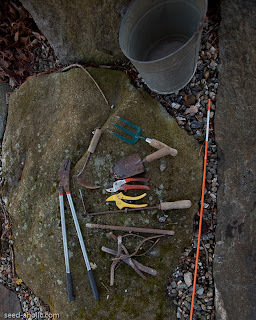 It's fascinating to compare tools: I have a very different assortment (in fact, every gardener I know has a radically different assortment). I am frankly horrified by your single trowel (I've had that brand...near the bottom of my list of faves): I have at LEAST twenty trowels! But you outclass me terribly with all those yummy crevice stuffers. Is there an emoticon for jealousy?